This is going to be a series of blog posts due to the limited amount of free time I have to allocate to the proper research and writing of an all-inclusive blog post on iOS 11. More work is needed to make sure nothing drastic is missing or different and to dive deeper into the artifacts that others have reported to me as currently being unsupported by tools. Maps – /private/var/mobile/Applications/com.apple.Maps/Library/Maps/History.mapsdata – Still missing? Refer to my blog post from Dec.
To get this post done in a timely manner, I found one item that has always been parsed and jumped out as “missing” or not completely supported. iMessages and SMS in iOS 11 were the first items that jumped out as “something is off…” and I was right. I sent test messages and could not locate them in the tools as easily as I have done in the past. I normally sort by date, because I know when I send something. Up until this release of iOS, we could rely on our tools to parse the sms.db and parse it well. The tools consistently parsed the message, to/from, timestamps, attachments and even deleted messages from this database. Things have changed with iOS11 and it doesn’t seem that our tools have caught up yet, at least not to the same level they were parsing older iOS versions. One of the most frustrating things I find is that the tools need access to different dumps in order to parse the data (as correctly as it could for this version). 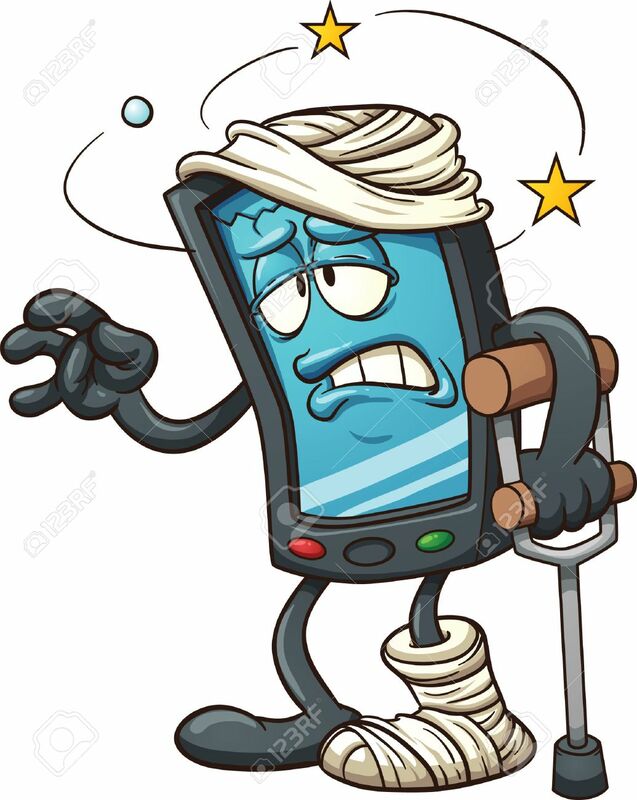 For example, Oxygen didn’t provide access to the sms.db for manual parsing, nor did it parse it for examination when the tools was provided and iTunes backup. 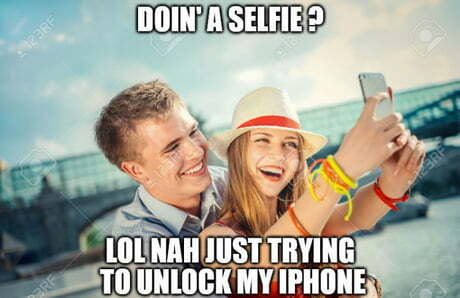 This had nothing to do with encryption, because the passcode was known and was provided. UFED isn’t the same as PA Method 1 and 2 (you have heard this from me before), but it’s confusing because most don’t know the difference. This is what it looked like when I imported the iOS 11 backup into Oxygen. Believe me, there are more than 3 SMS/iMessages on my iPhone. 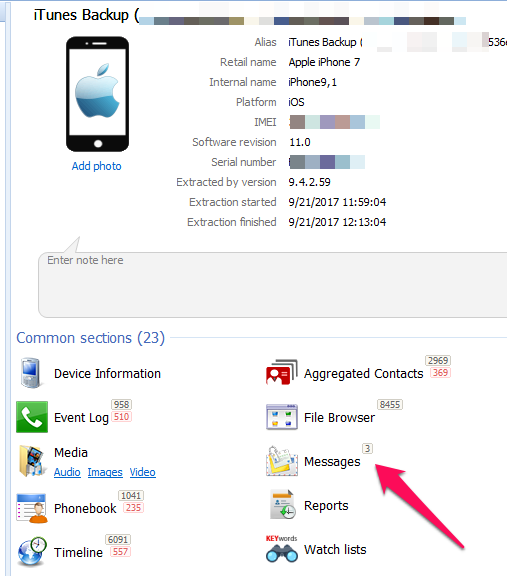 However, I when I dumped my iPhone logically using Oxygen Detective, it parsed the SMS and provided access to the sms.db. When I say “parsed” the sms.db, I am not referring to timestamp issues at all, those will be addressed in a bit. Here is what my device looked like when I dumped it and parsed it in Oxygen. Spot the differences in the messages? Yep, you now see 48,853 more! Crazy… all because the data was extracted a different way. I also tested adding in the PA, Method 1 image and those message numbers were different, but the sms.db was available and parsed. You really have to dump these devices in different ways to get the data! Bottom line – add the sms.db to something you need to manually examine for iOS 11 to ensure your tool is grabbing everything and parsing it. 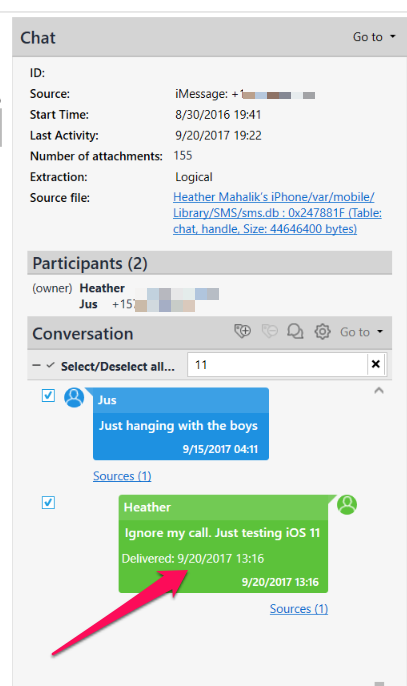 The rest of this blog is going to focus on just that – parsing the sms.db in regards to changes found in iOS 11. Additional tables appear to be used? The timestamp is different for iOS 11 – SOMETIMES! Thetimestamp fields for the sms.db are all over the place now. What I am seeing is that the length of the Mac Absolute value varies between two formats and both of these formats can be stored in the same column. This is why the tools are struggling to parse these dates. Additionally, the tables in the sms.db differ in how they are storing the timestamp. So, if your tool is parsing it correctly, excellent – but still take a look at the tables. Here are some examples of what this mess looks like. The column below is from the chat table in the sms.db. Notice how it has the traditional Mac Absolute value ( number of seconds since 01/01/2001), while others are a 18 digit Mac Absolute values and some are 0 (sent messages). Additionally, I was seeing some that were 18 digits that were not appended with 00s at the end. 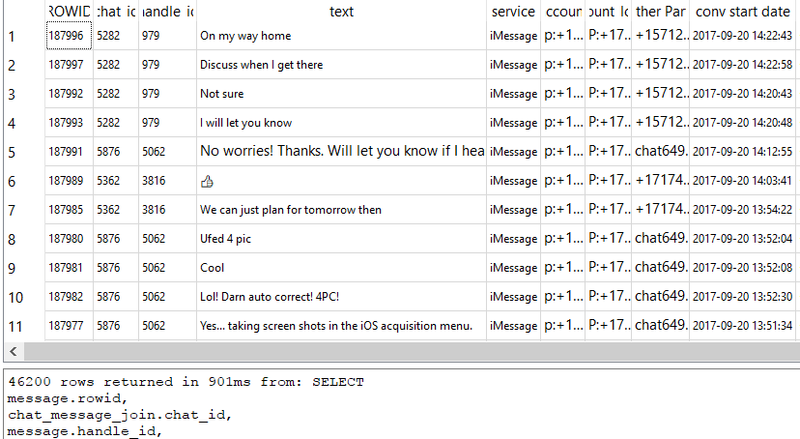 The “conv start date” on the left column is from the messages table in sms.db and this timestamp has not changed. As expected, your tools handle this one nicely. The table on the right column is from the chat_message_join table, and this caused a little havoc as well due to the variety of timestamps in the column. Converting this wasn’t fun! Thanks Lee for your help here. You, my friend, ROCK! 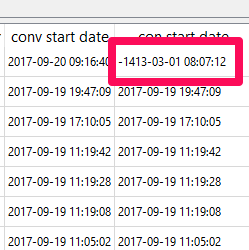 When I first ran my SQL query, I noticed this one pesky date that wasn’t converting. This is because it was the timestamp highlighted above and I needed to beef up my query to handle this. If you see a date that looks like the one below, something is up and you aren’t asking for the data to be rendered correctly. The query below will handle this for you. Don’t believe me that this causes issues yet, take a look at how it looked in one tool. The dates and times are not parsed correctly. 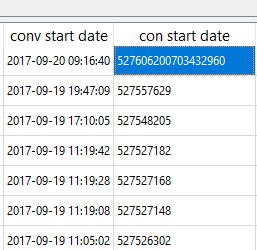 I found that the dates and times appear to be consistent when the tools are parsing the 9 digit Mac Absolute timestamps from specific tables. Otherwise, expect to have to do this yourself. Here is where it was correct, but this wasn’t the case for all of my messages sent using iOS 11. 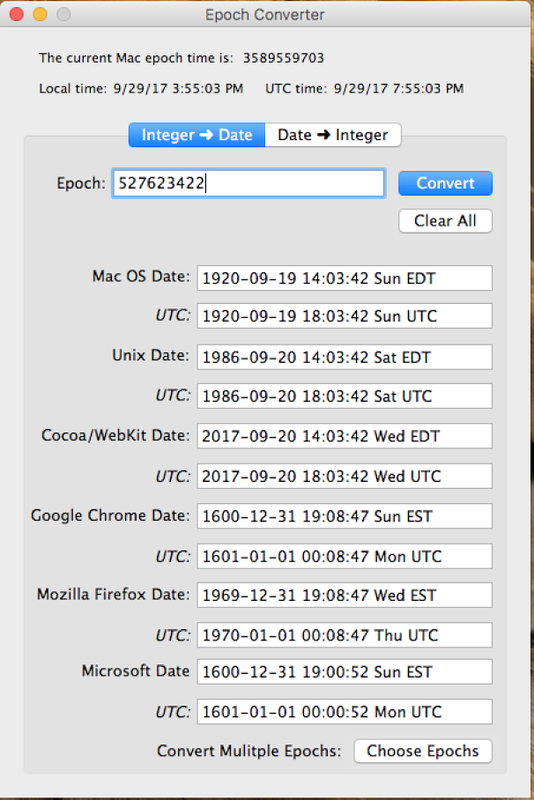 If you need a sanity check, I always like to use the Epoch Converter that I got for free from BlackBag to make sure I am not losing my mind when dealing with these timestamps. Below, you can see it was parsing it correctly (Cocoa/Webkit Date). Also, I love that it gives you both localtime and UTC. This leads me to the good news -below is the query that will handle this for you. This query is a beast and “should” parse all sms and iMessages from the sms.db REGARDLESS of the iOS version, but only columns that I deemed interesting. (Note that I state should, because this has only been run across a few databases and you should report any issues back to me so they can be fixed.) Take this query and copy and paste it into your tool of choice. Here, I used the DB Browser for SQLite because it’s free. I limited some columns to the ones I care about the most, so you should make sure this query isn’t missing any columns that may be relevant to your investigation. Here is a snippet of what this beauty looks like. (Note: this screenshot was taken prior to me joining attachments – aka MMS). I always stress that you cannot rely on the tools to be perfect. They are great and they get us to a certain point, but then you have to be ready to roll up your sleeves and dive in. What’s next – applications, the image/video files that apparently aren’t parsing correctly, interesting databases and plists new to iOS 11 and the pesky maps. That one is still driving me crazy! Stay tuned for more iOS 11 blogs and an upcoming one on Android 7 and 8. Thanks to Lee, Tony, Mike and Sarah for keeping me sane, sending reference material, testing stuff and helping me sort these timestamps out. Like parenting, sometimes forensicating “takes a village” too. I have come across something a bit strange, or it maybe that I haven;t noticed it previously? 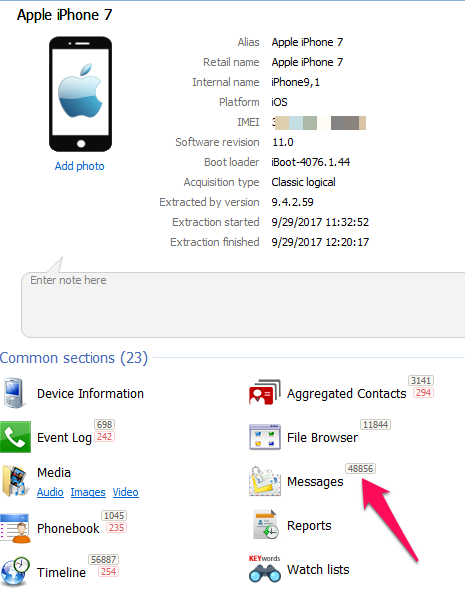 I am examining an iPhone 7 with 11.0.3 using Oxygen 9….. the first issue I noticed was that Oxygen reported an error with the retrieval of messages from the sms.db file. When looking at the results and trying to validate what it had and hadn’t pulled, I noticed that the iMessage message data was not found in the text column in the message table. I exported the sms.db file and looked at it in a sqlite viewer, and the same thing occured; there was a value of null in the text field. I ran the acquisition a second time and the same thing happened. I should note that Oxygen did pull all the iMessages, but I am unsure exactly where the text data for the message is kept? I ran the same phone through Cellebrite; cellebrite appeared to pull all the messages, but again when looking for the iMessage data I couldnt find it in the sms.db table. Any thoughts? All messages, but SMS and iMessage will be in the SMS.db. The tools may be choking on how to parse it based upon flags. Hello! I’m using DB Browser for SQL Lite, but I’m not sure if there was a syntax change in an update (although I don’t see any release changes since Sep 17). I am getting a syntax error with that query on “Other Party” and each quoted text thereafter. If I change them to single quotes, then it errors on the first ‘=’ sign (for length). Am I forgetting to do something after loading the sms.db into DB Browser? (I can SELECT * and get everything normal).